This 5-day holiday package offers a broad selection of great adventure highlights - glacier hiking, Ice climbing, snorkeling, sight seeing, blue lagoon and more. 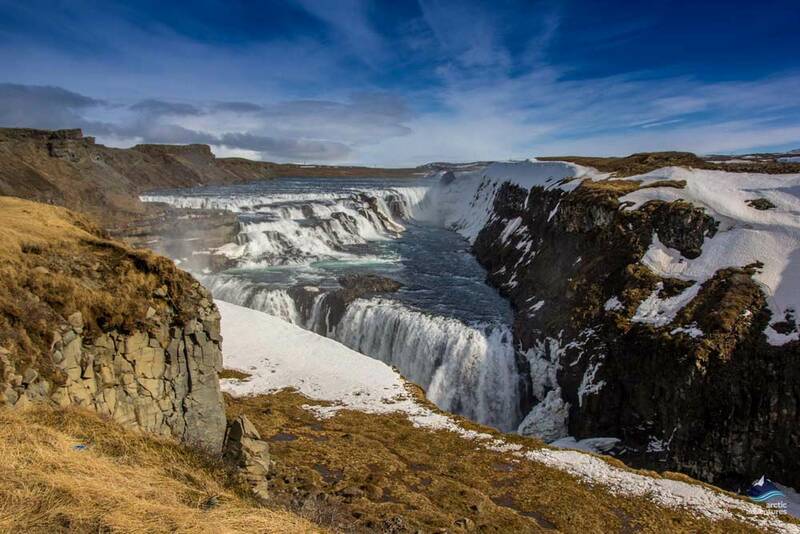 This is the king of package tours for those who want to experience all of the spectacular adventures that Iceland can deliver: snorkeling in Silfra, lava caving, an amazing ice climb, glacier hiking, horseback riding and more. 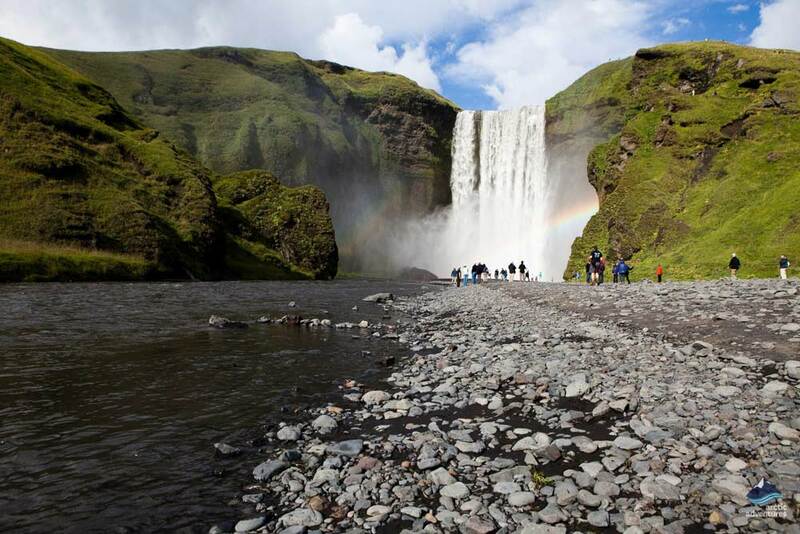 This tour offers an amazing opportunity to truly know this land of fire and ice. An adventurer by day, each night you return to Reykjavík with its exciting restaurants and nightlife. 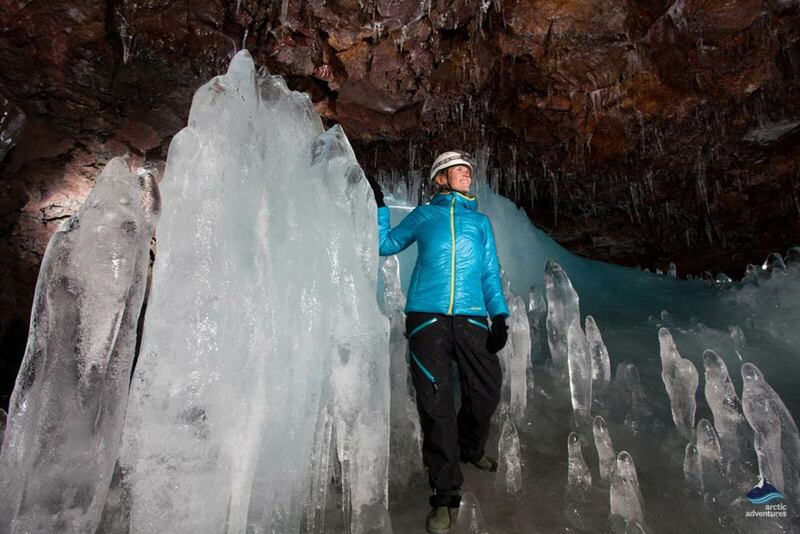 This Reykjavík package tour is the very best of winter adventure packages. Full details about each day’s activities are shown in the itinerary. Riding an Icelandic horse is a unique experience which no visitor to Iceland should miss out on, these horses have a unique fifth gait, tölt. The Icelandic horse was brought to Iceland in the 9th century, and the breed has been kept pure. 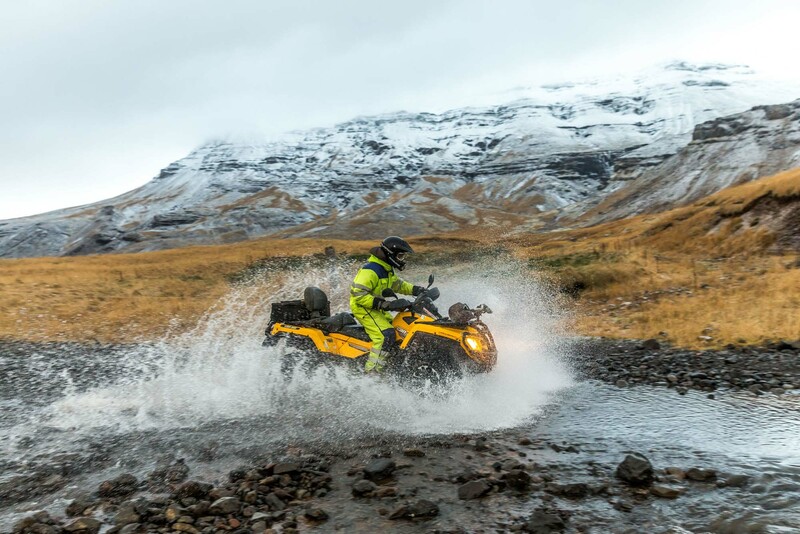 Small but incredibly strong, these horses are perfectly suited to the rough Icelandic terrain. You just have to ride an Icelandic horse! 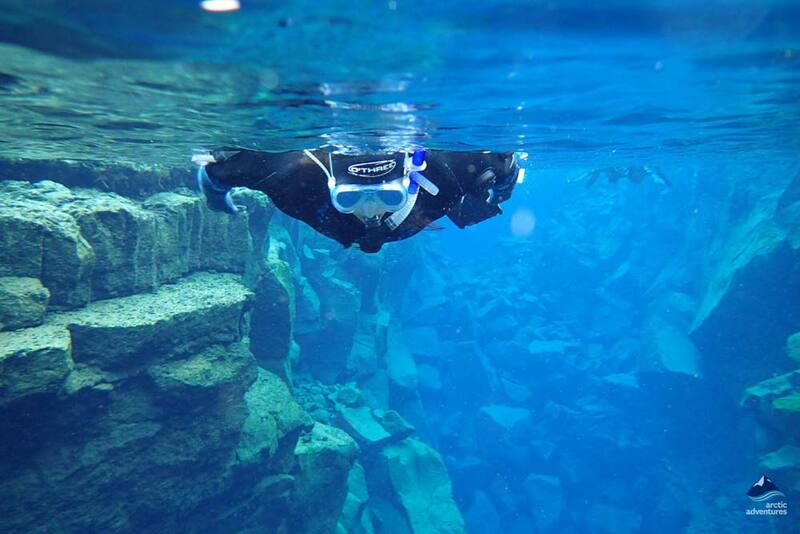 The unrivaled visibility of Silfra fissure, unique geological situation and the kind of underwater scenery usually only seen in the tropics, has made this a world top 10 dive. Silfra fissure is actually within the ravine in between the Eurasian and North American tectonic plates, these have been slowly moving apart at Þingvellir National Park. 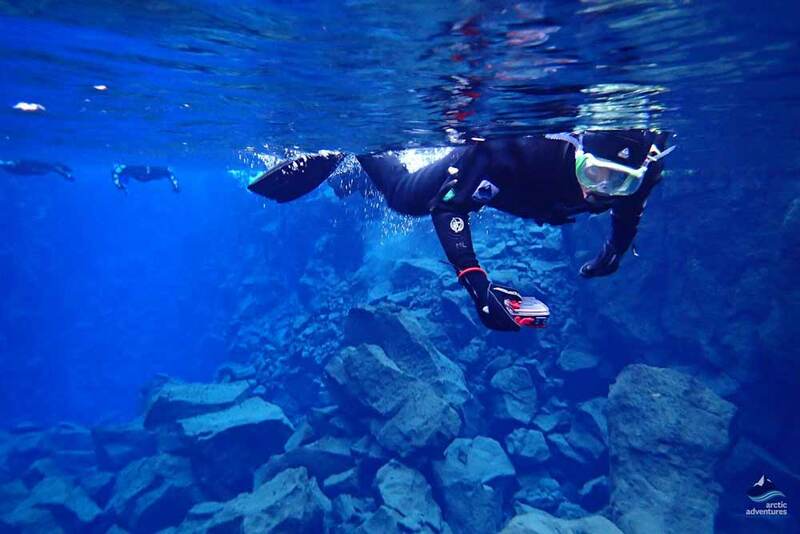 Diving between the tectonic plates is totally unique, you cannot do this anywhere else in the world! One of the best winter experiences in Iceland – our quality drysuit will keep you comfortable in the crystal clear glacial water. 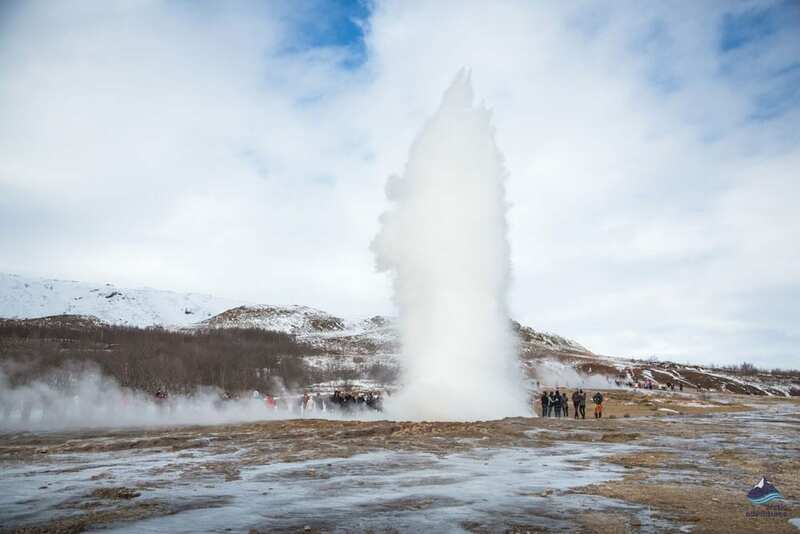 There are three components to the famous Golden Circle: Geysir, home to the famous hot spring which gave us the English word ‘Geyser’, see torrents of boiling water being erupted 25 m or higher! The geologically amazing, Þingvellir National Park, has the Mid-Atlantic Ridge running through it, right where Iceland´s historic parliament, Alþingi, one of the oldest parliaments in the world, was founded in 930 CE. 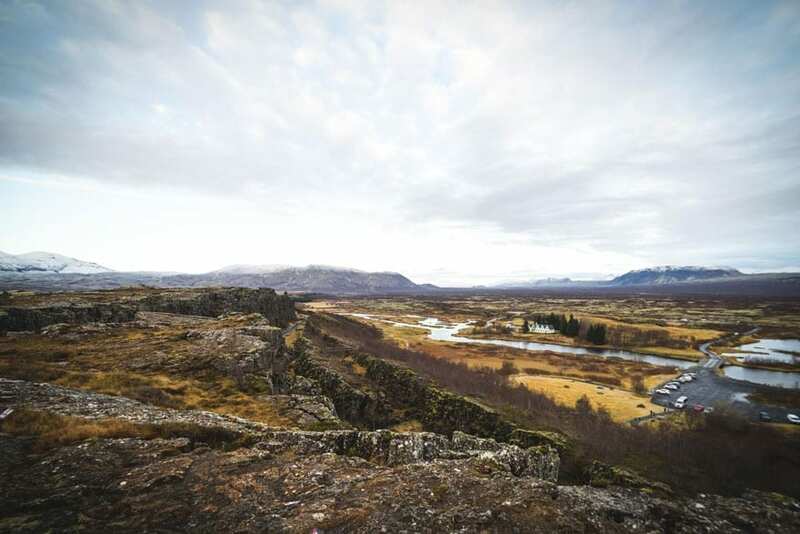 The amazing history and geology of Þingvellir have placed it on the UNESCO World Heritage Site list. Finally, Gullfoss, (the Golden Waterfall), feel the spray in the air and the sheer power of nature as the roaring water forces its way through the rugged falls, dropping 32 m in two stages. 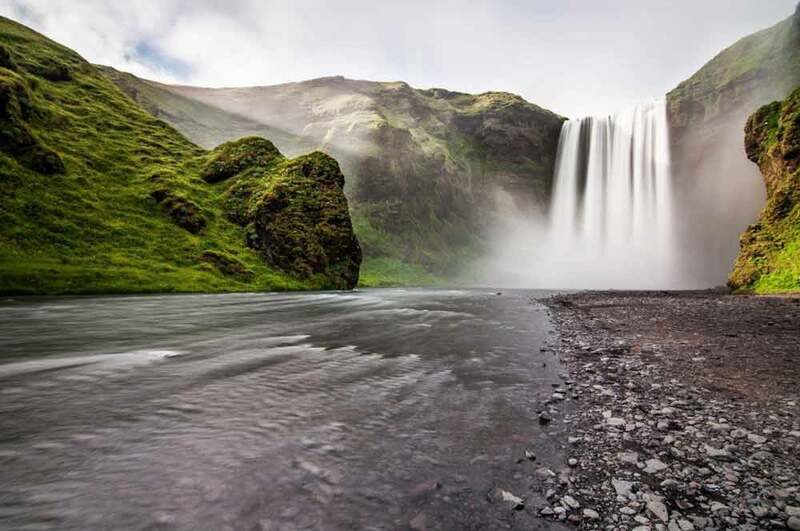 Iceland, the land of fire and ice, is one of the most volcanically active places on earth. Those eruptions have formed huge lava fields over the centuries, and sometimes incredible lava tube caves. Like the speleologist who discovered this lava cave you will get the opportunity to explore beneath the surface of Iceland. Your caving guide will explain the extraordinary and sometimes surprisingly colorful lava structures which were formed when high volumes of fluid lava flowed under lava which was already hardening. 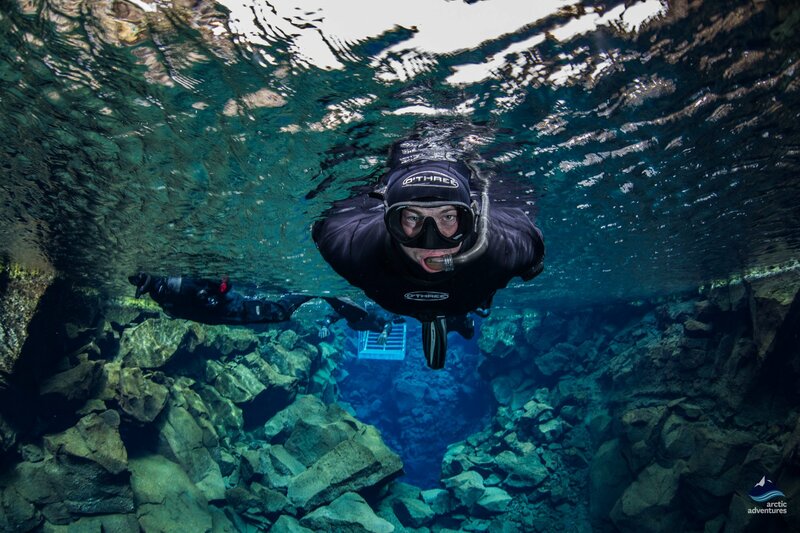 Delving beneath the surface you will see an amazing side of Iceland! Two totally magical glacier experiences! 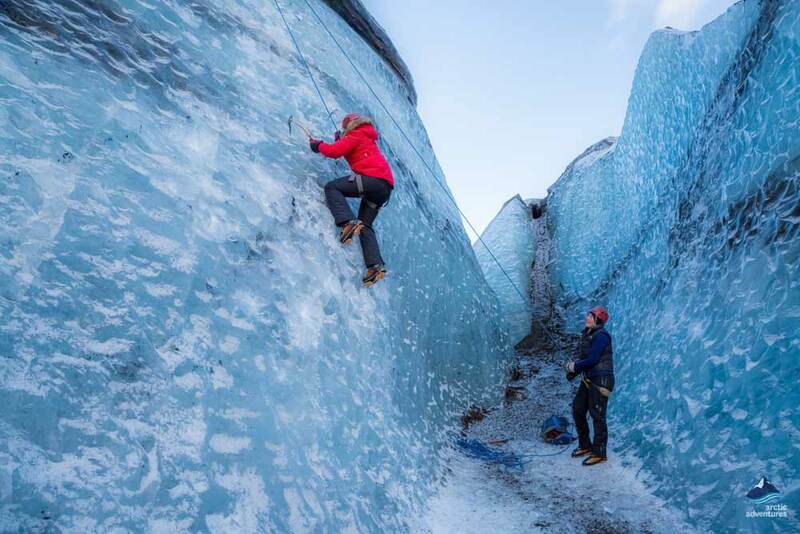 You get to hike and go ice climbing on magnificent Sólheimajökull, a majestic glacier tongue of the great Vatnajökull, the largest glacier in Europe. 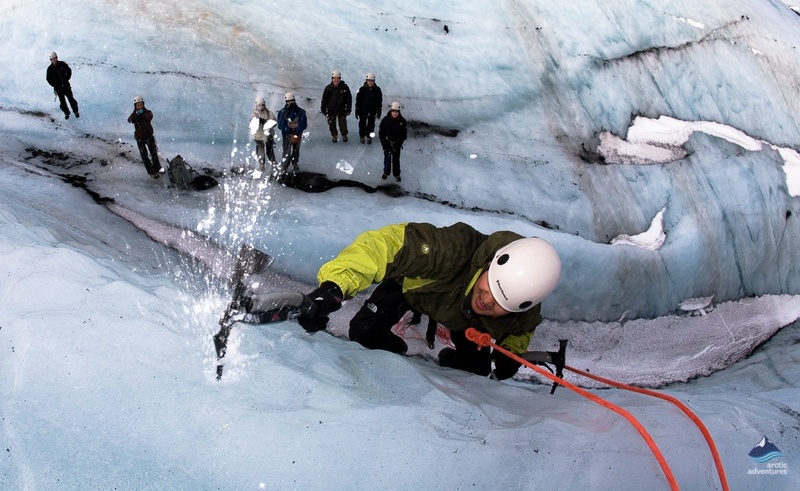 Equipped with ice crampons, ice axes, helmets and all of the other glacier hiking and ice climbing equipment you need for your great ice adventure. Your guide will explain ice climbing techniques and how to use these tools then you are off to hike and climb on this rugged, raw and constantly changing frozen wonderland. You will see and learn all about the dramatic sink holes, crevasses and really jagged ice ridges which are part of this glacial world. Overall this combination tour is classed as easy. Ice climbing is classified as a moderate activity. This means it is suitable for those with no glacier experience who are in a reasonable physical condition. The iconic Blue Lagoon is one of the first places which comes to mind when people think about Iceland. Being located so perfectly, in the middle of a lava field in between the airport and the capital, it kind of is a must-see for anyone traveling to Iceland. The Blue Lagoon’s water is natural, pumped up through the ground where it has been heated by the hot lava flowing underneath the surface. It is rich in minerals like silica, which will leave your skin smooth and soft and is actually known to have healing powers for psoriasis and eczema. Doctors in Iceland write prescriptions for people to go to the lagoon. Soak in this magical lagoon in the most amazing Icelandic lava scenery. You will not be disappointed. ATV & Horses: 09:00 am – duration about 9 hours. 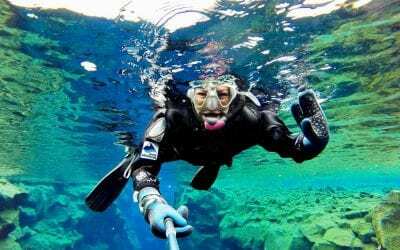 Snorkeling in Silfra: 09:00 am – duration about 4 hours with the transfer. Blue Ice Glacier hiking and climbing: Pick up starts at 08:00 am – duration 10 hours with the transfer. Blue Lagoon and Reykjavík: Pick up can vary depending on when you want to visit the Blue Lagoon. Remember to bring: For this package tour you will need to have warm and waterproof outdoor clothing, headwear, gloves, hiking trousers, fleece or wool tops, hiking shoes, warm undergarments (fleece/wool sweater and pants), bathing suit, sunglasses (it can be very bright on the glacier) and a towel. Do not forget your camera! Flights, lunch, dinner, and accommodation are not included in this tour. Pick up at 9:00 from your accommodation or a nearby location in Reykjavík. Please note: the pick up process can take up to 30 minutes but you do need to be ready and waiting at 09:00. 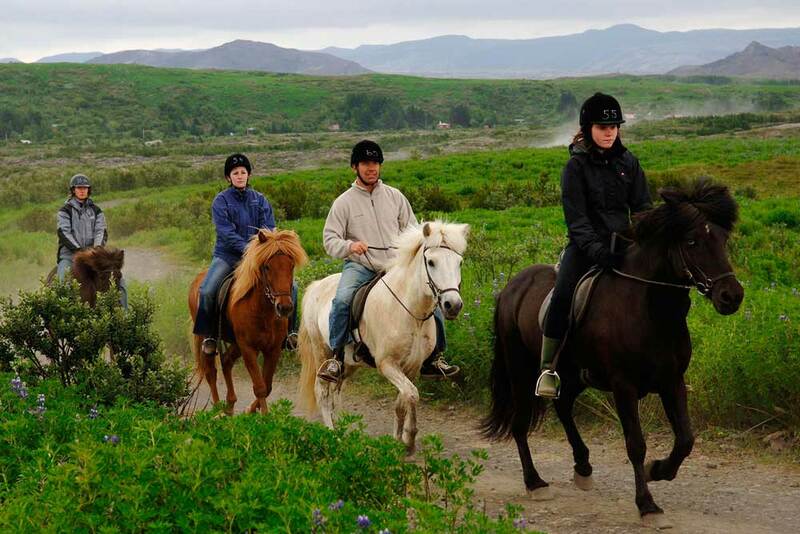 We drive out of the city to Íshestar, a horse farm set in spectacular surroundings close to the Bláfjöll Mountains. We will saddle up ready for our Icelandic horseback adventure which will take us through the lava fields close to, Helgafell, a fabulous mountain volcano. This is a classic horse riding tour through stunning and dramatic scenery, the lunar vistas of the lava field will leave you in no doubt at all that you are in Iceland! You will ride through vast lava fields and across beautiful hillsides to Hvaleyrarvatn, a stunning and charming lake just south of Hafnarfjörður. This area around this beautiful and picturesque lake is much-prized as a recreation area by local people. Icelandic horses are well-behaved and the riding paths here are safe giving you the chance to really appreciate the superb scenery, with the beautiful Bláfjöll Mountains (the Blue Mountains) framing the horizon. You are then brought back to Reykjavík where you get a short break before being picked up for your ATV ride. 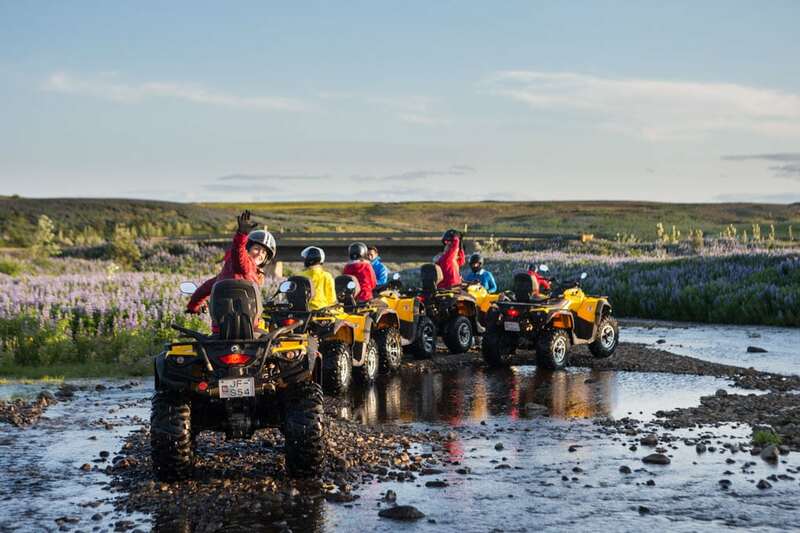 At the ATV base near Mossfellsbær a powerful and rugged 650 cc CanAm Outlander Max Quad Bike will be waiting for you. Some simple instructions and you are ready to ride! Your adventure starts with a journey to Hafravatn, a stunning lake beneath steep mountains, with some lovely wooded areas. This is a very popular fishing and picnicking spot with Icelanders, a few of whom are lucky enough to have summer houses with views of the lake. Now to get the adrenaline really flowing! Roaring off to the top of Mount Hafrafell will certainly do that! From the top the views, on a clear day, are mind-blowing, Mount Úlfarsfell, the valleys behind Mosfellsbær, the whole of the bay around Reykjavík and the Reykjanes peninsula will stretch out before you. This really is the most magical way to explore the mountains on the outskirts of the city! Remember to bring: Warm outdoor clothing, sturdy shoes, headwear and gloves. Pick up at 9:00 from your accommodation or a nearby pick up location in Reykjavík. Please note: the pick up process can take up to 30 minutes but you do need to be ready and waiting at 09:00. We start with a visit to a fascinating lava tube cave beneath the lava field at Bláfjöll (the Blue Mountains), not far from Reykjavík. 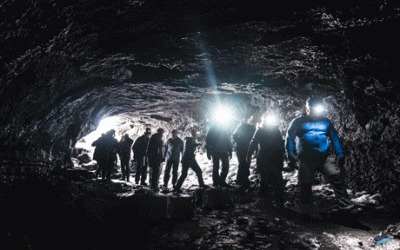 Your qualified and experienced caving guide will get you kitted out with a helmet and a torchlight before escorting you down into the lava cave tube. You will learn how the incredible lava formations were created in this stunning and surprisingly colorful world. Sometimes the cave is amazingly spacious and high, in other parts you will need to travel on all fours. 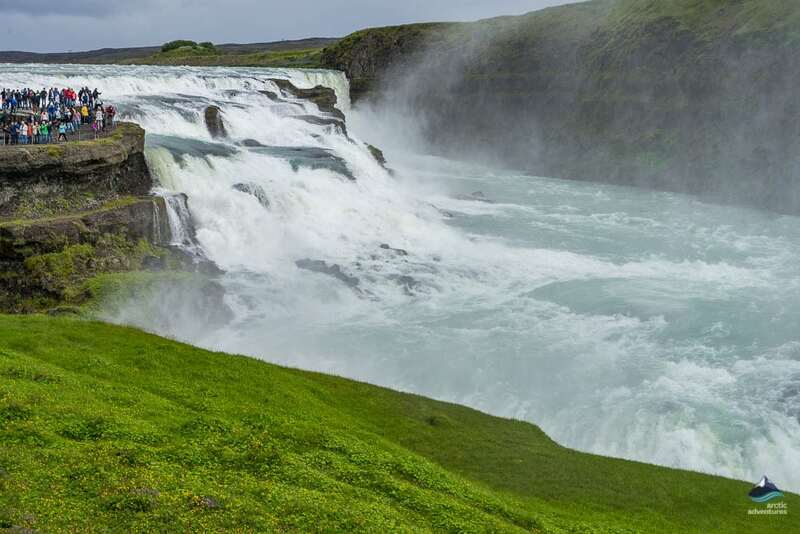 You then travel to the Golden Circle: Gullfoss (the Golden Waterfall), Geysir, to see Strokkur erupting huge volumes of superheated water every 8 to 10 minutes and then Þingvellir National Park. Here you will see the amazing site of Iceland´s first parliament, Alþingi, which was founded in 930 AD. This amazing place is the site of the oldest continuous parliament in the world and one of the greatest geological wonders. It can clearly be seen here how the tectonic plates have moved apart creating the magnificent and rugged rift valley. This day tour has it all: stunning natural beauty, interesting history, amazing geological wonders and a great caving adventure! Pick up at 09:00 from your accommodation or a nearby location in Reykjavík. Please note: the pick up process can take up to 30 minutes but you do need to be ready and waiting at 09:00. 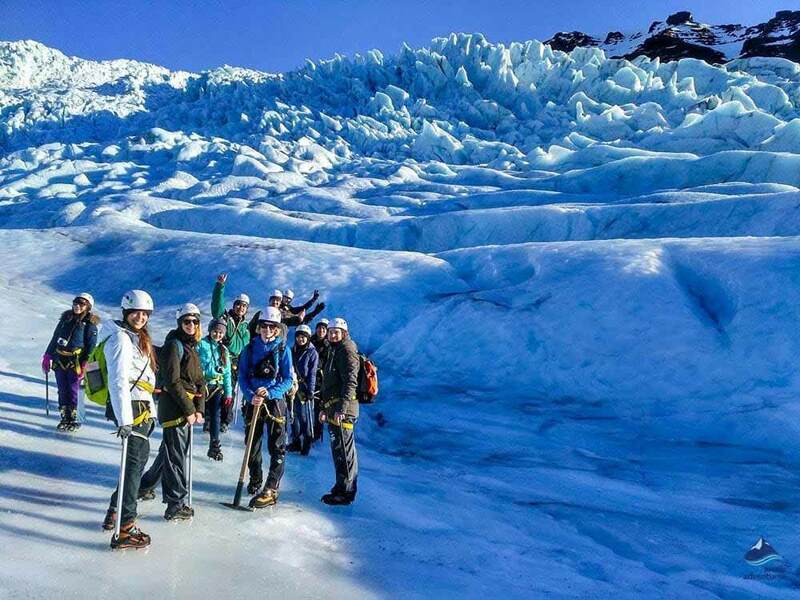 Here is your chance to hike and climb on an immeasurably majestic Glacier! This tour will take you onto the amazing frozen world of Sólheimajökull glacier, a rugged, raw and constantly changing glacier tongue of Myrdalsjokull ice cap. 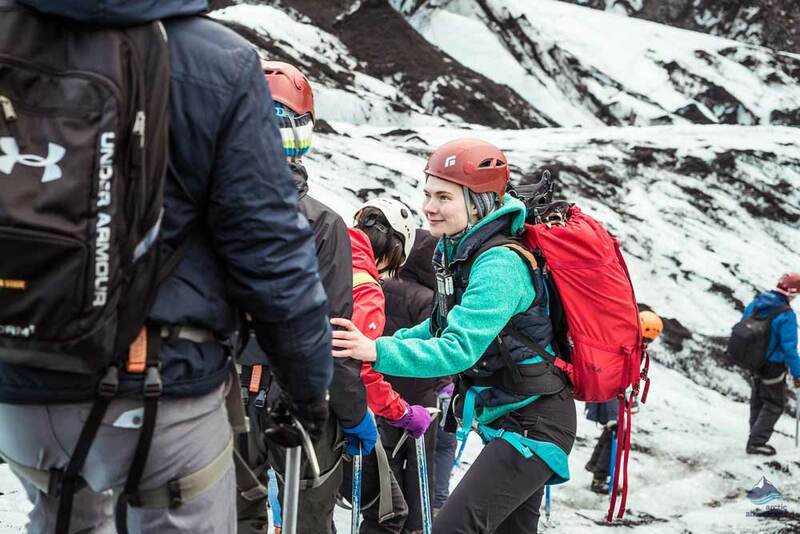 With a professional glacier guide, who will provide you with all of the necessary glacier equipment, you will explore Sólheimajökull. Your guide will explain the extraordinary ice formations of this crevasse riddled outlet glacier, you will see sinkholes and jagged-toothed ice ridges. Those who want to can then test our ice climbing skills on the glacier using ice axes, crampons and safety lines. This glacier experience of a lifetime will leave you with unforgettable memories. On the way back to Reykjavík we even stop at Skógafoss, a beautiful waterfall! Pick up: Today you can sleep in a little if you want or take more time to explore Reykjavík on your own! There are several departures each day to the Blue Lagoon so you just need to book the option which suits you best according to availability. The Blue Lagoon is now a world famous spa. Make the most of the opportunity to bathe in the milky, silky smooth and skin soothing waters and to totally relax in the lunar landscape. Facilities include a shop, cafeteria, the Lava Restaurant and a bar offering an impressive cocktail menu. Enjoy the final day of your cream of adventure tours experience!